This well presented book is a very personal potted history of hunting from James Barclay’s childhood in the sixties until his mid twenties. His early memories of living in a family whose history is seeped in fox hunting leave little doubt about where James’ passion for hunting and for the country has come from and from a very early age this is someone who has devoted his whole life to the complete understanding of both. 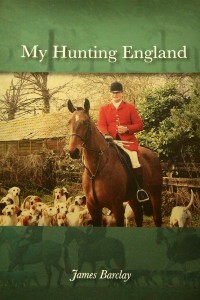 Very few aspiring M. F. H’s will have the luxury of the years James was able to spend learning his trade, but the book gives us a real insight into the many unexpected facets of a job that involves as much an understanding of the countryside as it does of running a successful hunt country. The book goes on to give us a short insight into the lives of a number of great countrymen and well known legends of the chase, all evocative names such as Michael Farrin, Jim Lang, John Cook, Peter Collins and many others whose names should be included in any sportsman’s library. Interspersed with the exploits of his heroes are some strange and somewhat unnerving tales of the chase. Many of these tales are well documented and in bringing them together, all well evidenced, they are thought provoking. His insight and depth of knowledge make it a collector’s item.